Word has reached our group with the passing of Delta Golden Wings member retired Delta pilot Captain Robert ‘Bob’ Fuhrmann Myers, age 88. 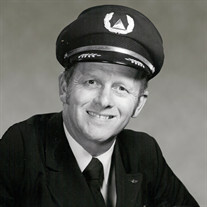 Captain Myers joined Delta Air Lines 04-30-1956 and was based New Orleans and Atlanta. He is survived by his wife Gae Kiefer Myers, their children plus grand- and great grandchildren. 2100 W 21st Ave., Covington LA 70433-7413. Robert F. Myers passed away on Wednesday, February 14, 2018 at his home in Covington, LA. He was born on September 3, 1929 in Goodbee, LA to the late Walter Myers and Vivian Fuhrmann Myers. Bob was married to his beloved wife, Gae Kiefer Myers, for 67 years. He was the loving father of Robert “Greg” Myers (Lisa Menetre Myers), Robyn M. Bossom (Joseph Bossom), Terri A. Myers, and Melinda M. Breaux (Barry Breaux). He was the proud grandfather of Will Myers, Bryan Myers (Lauren), Ainsley B. Faulk (Benjamin), Ashley B. Jarreau (Cameron), Gavin Breaux, and Macie Breaux. Bob was the great-grandfather of Beau and Bennett Myers. He was the brother of the late Leah F. Bennett. Robert retired as a commercial international airline pilot, flying for Delta Airlines, after 34 years of service. During his life, he enjoyed many hobbies, including fishing, gardening, furniture making, going to the gym and, most of all, family gatherings. ... Bob Myers son called me this afternoon and told me that Bob passed away last night. He had been very ill for a good while. Visitation will be on Saturday, February 17th at Holy Trinity Lutheran Church, 1 North Marigold Drive, Covington, LA from 1 until 3 p.m. with the burial following at Pinecrest Memorial Gardens, 2280 West 21st Avenue, Covington. Would you please forward this to someone at Delta. Thanks.